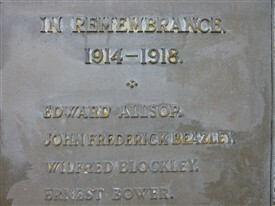 Edward Allsop was born in 1879 so he was already nearly 36 when he volunteered and joined the army on 19th November 1914. He came from a large family with seven brothers and two sisters still living in Mansfield, as well as his widowed father who was also called Edward. He had married Mary Ann Dean in October 1903 and they had four children: Edward (aged 9), Hilda (7), Samuel (2) and Mary who had been born on January 1st 1914. He was a plasterer by trade and they lived at 60 George Street. 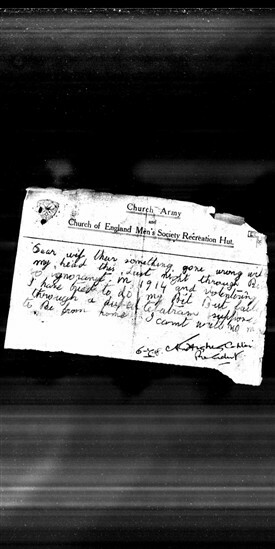 After training in England, including the regimental depot at Derby, Allsop went to France with 14th Battalion of the Sherwood Foresters, embarking from Folkestone on 31st August 1915. In December he was given 7 days Field Punishment No. 2 (isolation, cross-country runs, no cigarettes, etc.) 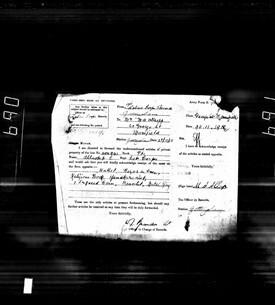 for “not complying with an order.” He was in trouble once or twice again, being confined to “P.B.” [Punishment Barracks] in November 1916 and January 1917, but this would have been for minor misdemeanours like failure to clean a weapon properly. On 8th October 1917 he was transferred to the Labour Corps, probably due to being less than A-1 fit, though his medical records do not appear to have survived. The ‘Bracelet’ may have been an early form of identity tag, though these were often privately made, not yet standard issue during the war. It looks as though he had received bad news from home which he did not want to believe; tragically a frequent cause of suicides amongst servicemen. The Court of Inquiry mentioned that ‘special leave had been recommended for this man as his mother was dangerously ill’ and charitably attributed his death to ‘temporary insanity’. 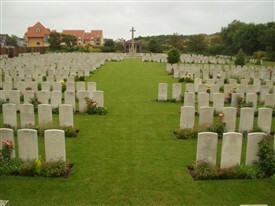 He is buried at Les Baraques Military Cemetery In Sangatte near Calais and commemorated on the Unitarian war memorial at the Old Meeting House, Mansfield. This page was added by Ralph Lloyd-Jones on 12/08/2014.